The name of St. Callistus is rendered famous by the ancient cemetery which he beautified, and which, for the great number of holy martyrs whose bodies were there deposited, was the most celebrated of all those about Rome. He was a Roman by birth, succeeded St. Zephirin in the pontificate in 217 or 218, on the 2nd of August, and governed the church five years and two months, according to the true reading of the most ancient Pontifical, compiled from the registers of the Roman Church, as Henschenius, Papebroke, and Moret show, though Tillemont and Orsi give him only four years and some months. Antoninus Caracalla, who had been liberal to his soldiers, but the most barbarous murderer and oppressor of the people, having been massacred by a conspiracy raised by the contrivance of Macrinus, on the 8th of April 217, who assumed the purple, the empire was threatened on every side with commotions. Macrinus bestowed on infamous pleasures at Antioch that time which he owed to his own safety and to the tranquillity of the state, and gave an opportunity to a woman to overturn his empire. This was Julia Moesa, sister to Caracalla's mother, who had two daughters, Sohemis and Julia Mammaea. The latter was mother of Alexander Severus, the former of Bassianus, who being priest of the sun, called by the Syrians Elagabel, Emesa, in Phoenicia, was surnamed Heliogabalus. Moesa, being rich and liberal, prevailed for money with the army in Syria to proclaim him emperor; and Macrinus, quitting Antioch, was defeated and slain in Bithynia in 219, after he had reigned a year and two months, wanting three days. Heliogabalus, for his unnatural lusts, enormous prodigality and gluttony, and mad pride and vanity, was one of the most filthy monsters and detestable tyrants that Rome ever produced. He reigned only three years, nine months, and four days, being assassinated on the 11th of March 222 by the soldiers, together with his mother and favorites. His cousin—German and successor, Alexander, surnamed Severus, was for his clemency, modesty, sweetness, and prudence one of the best of princes. He discharged the officers of his predecessor, reduced the soldiers to their duty, and kept them in awe by regular pay. He had in his private chapel the images of Christ, Abraham, Apollonius of Tyana, and Orpheus, and learned of his mother, Mamma a, to have a great esteem for the Christians. It reflects great honour on our pope that this wise emperor used always to admire with what caution and solicitude the choice was made of persons that were promoted to the priesthood among the Christians, whose example he often proposed to his officers and to the people, to be imitated in the election of civil magistrates. It was in his peaceable reign that the Christians first began to build churches, which were demolished in the succeeding persecution. Lampridius, this emperor's historian, tells us that a certain idolater, putting in a claim to an oratory of the Christians which he wanted to make an eating-house of, the emperor adjudged the house to the Bishop of Rome, saying it were better it should serve in any kind to the divine worship than to gluttony, in being made a cook's shop. To the debaucheries of Heliogabalus St. Callistus opposed fasting and tears, and he every way promoted exceedingly true religion and virtue. His apostolic labours were recompensed with the crown of martyrdom on the 12th of October 222. His feast is marked on this day in the ancient Martyrology of Lucca. The Liberian Calendar places him in the list of martyrs, and testifies that he was buried on the 14th of this month in the cemetery of Calepodius, on the Aurelian Way, three miles from Rome. The pontificals ascribe to him a decree appointing the four fasts called Ember-days; which is confirmed by ancient Sacramentaries, and other monuments quoted by Moretti. He also decreed that ordinations should be held in each of the Ember-weeks. He founded the Church of the Blessed Virgin Mary beyond the Tiber. In the Calendar published by Fronto le Duc he is styled a confessor, but we find other martyrs sometimes called confessors. If St. Callistus was thrown into a pit, as his acts relate, it seems probable that he was put to death in some popular tumult. Dion mentions several such commotions under this prince, in one of which the praetorian guards murdered Ulpian, their own prefect. Pope Paul I and his successors, seeing the cemeteries without walls, and neglected after the devastations of the barbarians, withdrew from thence the bodies of the most illustrious martyrs, and had them carried to the principal churches of the city. Those of SS. 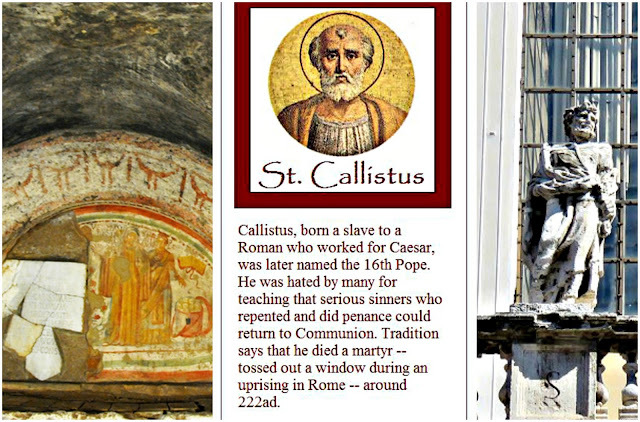 Callistus and Calepodius were translated to the Church of St. Mary beyond the Tiber. Count Everard, lord of Cisoin or Chisoing, four leagues from Tournay, obtained of Leo IV, about the year 854, the body of St. Callistus, pope and martyr, which he placed in the-abbey of Canon Regulars which he had founded at Cisoin fourteen years before; the church of which place was on this account dedicated in honour of St. Callistus. These circumstances are mentioned by Fulco, Archbishop of Rheims, in a letter which he wrote to Pope Formosus in 890. The relics were removed soon after to Rheims for fear of the Normans, and never restored to the abbey of Cisoin. They remain behind the altar of our Lady at Rheims. Some of the relics, however, of this pope are kept with those of St. Calepodius, martyr, in the Church of St. Mary Trastevere at Rome. A portion was formerly possessed at Glastonbury. Among the sacred edifices which upon the first transient glimpse of favour, or at least tranquillity, that the church enjoyed at Rome, this holy pope erected, the most celebrated was the cemetery which he enlarged and adorned on the Appian Road, the entrance of which is at St. Sebastian's, a monastery founded by Nicholas I, now inhabited by reformed Cistercian monks. In it the bodies of SS. Peter and Paul lay for some time, according to Anastasius, who says that the devout Lady Lucina buried St. Cornelius in her own farm near this place; whence it for some time took her name, though she is not to be confounded with Lucina who buried St. Paul's body on the Ostian Way and built a famous cemetery on the Aurelian Way. Among many thousand martyrs deposited in this place were St. Sebastian, whom the Lady Lucina interred, St. Cecily, and several whose tombs Pope Damasus adorned with verses. In the assured faith of the resurrection of the flesh, the saints, in all ages down from Adam, were careful to treat their dead with religious respect, and to give them a modest and decent burial. The commendations which our Lord bestowed on the woman who poured precious ointments upon him a little before his death, and the devotion of those pious persons who took so much care of our Lord's funeral, recommended this office of charity; and the practice of the primitive Christians in this respect was most remarkable. Their care of their dead consisted not in any extravagant pomp, in which the pagans far outdid them, but in a modest religious gravity and respect which was most pathetically expressive of their firm hope of a future resurrection, in which they regarded the mortal remains of their dead as precious in the eyes of God, who watches over them, regarding them as the apple of his eye, to be raised one day in the brightest glory, and made shining lustres in the heavenly Jerusalem.